I’ll start with Texas Southern as that’s what is on everyone’s mind. Oregon laid a second half egg. 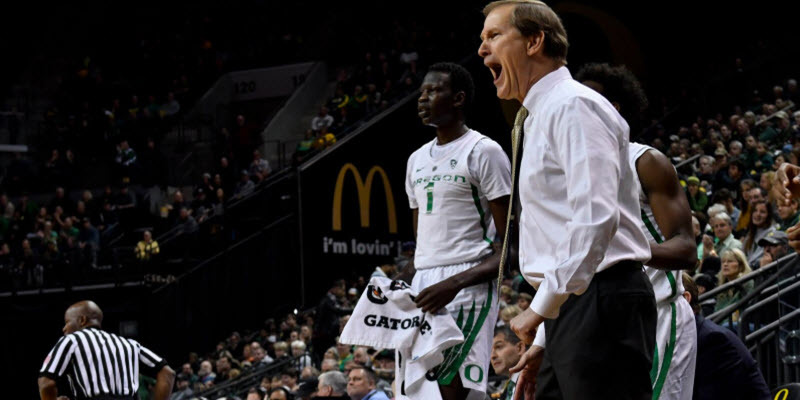 Bol Bol didn’t post up aggressively and got pushed toward the baseline, Oregon still doesn’t know who their second scorer is, and Paul White keeps making mental mistakes. He’s a fifth-year senior, so there are no excuses, really. And you have to put some blame on Coach Dana Altman for not calling timeouts, as Oregon’s inexperience showed. When Bol gets a clean look, he’s been unstoppable on offense. Texas Southern had 6-7 uncontested lob dunks in the second half alone. Weak side defenders did zero to stop Trayvon Reed from racing to the basket. Reed went 9-9 from the field, mostly on dunks as Oregon played horrific defense around the rim. You can’t blame Bol because he was defending the strong side where the ball is. Meanwhile White, Abu Kigab and everyone else stood flatfooted and failed to slow Reed from running to the rim. Pretty awful. Oregon was also out-rebounded by almost 10. Kenny Wooten wasn’t available after the half, but where were White or Kigab? They had exactly three rebounds… combined. Texas Southern is a tournament team but Oregon had its hat handed to them because they didn’t play defense or rebound. Oregon gave up 89 points at home, and 57 in the second half. 57 points! 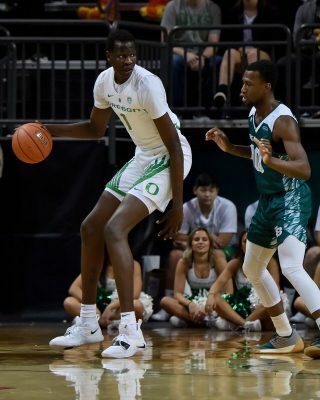 Oregon’s offense is basically Bol, and Payton Pritchard when he’s on. They looked spotty at best at Madison Square Garden against Iowa. Pritchard dribbled around, looking for someone to pass to, screens weren’t strong enough to free shooters, and the Ducks threw multiple lob passes to Bol that were way off target. But against Syracuse the Ducks figured it out. 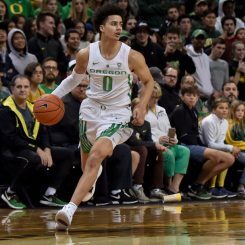 Shifting from the weave to the high post offense, the Oregon found a rhythm by getting the ball to the top of the free throw line, running shooters VJ Bailey and Pritchard to the wing, and passing to Bol and Wooten from better angles. Oregon also found its transition game off turnovers and rebounds. The Ducks got into their offense more quickly and spaced the floor with the ball at the point about four feet farther out. That allows an easier entry pass to the free throw line, an easier second pass to a cutter, or room to drive or shoot on the defender. Richardson may play more so Pritchard can be more of a scorer. Will Richardson has played more minutes the last couple games and Oregon’s four-guard rotation of Pritchard, Richardson, Ehab Amin and Bailey is settling in nicely. All four can defend, but they are all streak shooters. Altman will likely go with the hot hand until someone separates himself alongside Pritchard. I’m rooting for Bailey with his next-level athleticism. Oregon should be able to win a lot of games if the Ducks score in the high 70s this year. Few teams are going to score more than 65-70 points if Oregon plays hard on defense and rebounds. Without Louis King Oregon still needs a consistent scorer behind Bol, and it can’t be Pritchard unless Richardson runs the point (so watch for it). White’s shooting has been horrific since the beginning of the New York trip. He’s shot 8-33 and 1-13 from behind the arc. But his silly turnover as a result of a mental lapse inbounding the ball, a freshman mistake by a fifth-year senior, is what’s inexcusable. Oregon simply needs more from him or Altman needs to give Kigab or King those minutes (when King returns). Oregon has now signed four for the class of 2019 and they have at least two scholarships to offer, and three or more if anyone leaves early. Here’s a taste of who Oregon has signed as of now. One is a top JC player, Chris Duarte, from Northwest Florida State College (same school as Elgin Cook). The 6’6″ guard/forward will play the wing at Oregon and be asked to score off the high post and weave offense, and defend the perimeter. He averaged over 12 points and six rebounds per game last year. 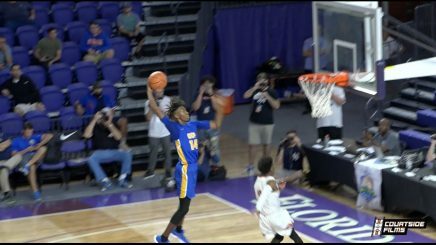 CJ Walker will literally dunk every chance he gets. Also signed is CJ Walker, who is the headliner of this class — for now. The 7th-highest rated player ever to sign with Oregon (just above Tyler Dorsey) is a guy who buys in to playing defense so much he can defend three positions (off guard, small forward or power forward). This makes him invaluable in the match-up zone. Walker has the length to defend the wing perimeter and the heart to defend at the top in isolation. A gym rat and a spectacular finisher at the basket — willing to fill the lane at all cost, with quickness and length. He could have the program impact of Dillon Brooks or Dorsey. Walker has NBA athleticism and draft potential, for sure. Chandler Lawson signed with Oregon over Florida and NC State. He also had offers from Ole Miss, Georgia Tech and Baylor. The 6’8″ forward brings more length and toughness, and is rated as a Top-100 player by every service out there. He’s a terrific player with a big body, and he is a workhorse as well. Oregon signed a center in 6’11” Isaac Johnson from Utah. The nation’s 10th-rated center has good hands, and brings range behind the arc and a quick release. He’ll take a two-year mission and join Oregon in 2021. Johnson’s star-rating counts toward Oregon’s 2019 class, but his scholarship won’t be used until 2021. Oregon has two to three scholarships left to award, and a decent chance to land high 4-star shooting guard Cassius Stanley. With all this talent and Altman at the helm — better times are ahead.